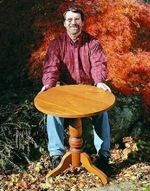 Norm is roaming the antique shops again and this time he finds a small round table made from teak lumber. Teak has the ability to withstand the weather so the table can be used indoors or outside too. The trick to these types of tables is joining the legs to the turned leg.